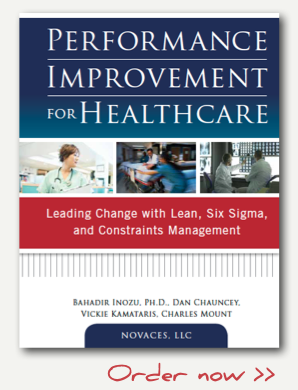 Performance Improvement for Healthcare: Leading Change with Lean, Six Sigma, and Constraints Management offers the “best of breed” integration of performance improvement approaches in terms of impacting patient experience, financial viability, and employee satisfaction. While the goal is to improve performance across all aspects of the organization, the path is through identifying processes that are not meeting expectations—and fixing them. CLICK HERE to preview Chapter 1. Unlike “one size fits all” approaches, such as Lean only or Six Sigma only, the approach in this book integrates three main methodologies – Lean, Six Sigma, and Theory of Constraints (TOC) – by focusing on what is critical to the organization. By using the right tool for the right problem at the right time, the authors show how to deliver faster results and greater return on investment. This pioneering guide presents a scalable strategy for managing bottlenecks, eliminating waste, reducing errors, and containing costs in healthcare organizations, as well as sustaining the gains achieved. Real-world case studies illustrate successful performance improvement implementations that have realized breakthrough operational and financial results. Three-part organization assessment—strategic gap analysis, system-level value stream analysis, and system constraint analysis. Published by McGraw-Hill Professional and available now from Amazon.com and major retailers! You can also preview Chapter 1 by clicking here.